I came away from this race last year in a state of shock. 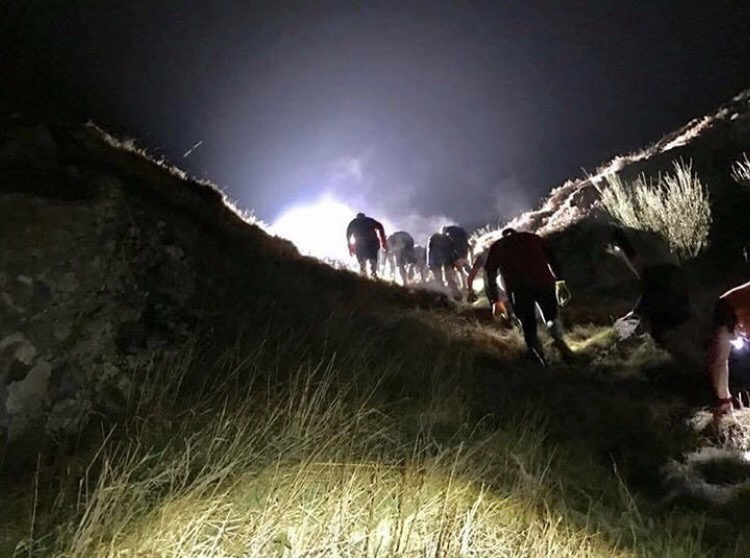 Having never run at night before, or tackled hills quite like that before it was an assault on all the senses and each time I have recounted the Deerstalker ‘story‘ since it has sent shivers down my spine. It was a race I said I would never do again. So it was with some trepidation that I found myself standing on the start line this year. Eager to see if I was made of tougher stuff but also very aware that this race deserves respect aswell as training. You can’t just turn up to Deerstalker and expect to wing it. We started in Wave 1, a whole herd of us from Warrior Fit and Race Fitness. I’m lucky enough to train with, and know some pretty badass athletes and there was a high chance one or more of them would podium this year. For me, it was all about beating my time and not crying at any point during my race. In stark contrast to last year we started our race in the daylight. If we were lucky we would get a good hour of running in before darkness descended. I have a pretty good sense of direction and recall but at the ‘top’ of Hill #1 I realised I had obviously blocked parts of the route from memory, given the fact we were only half way up. Running side by side with Lee and Audrey we manoeuvred our way up and up through narrow track and dense trees and mud, confident in the knowledge that we would reach the downhill section soon. It wasn’t the hills that scared me this year, I have forged a somewhat healthy relationship with hill running in the last 365 days. No, it was the river that was consuming the majority of my thoughts. And as we hit the flat at the bottom of the first hill it was at the forefront of my mind that we were about to get very wet and cold. And we did. Just after the course split into the half and full stalker sections we were met with the entrance to the river, and after sneaking a Jelly Baby from a lovely mini spectator we tentatively made our way up stream. Cold water and my sometimes negatives thoughts don’t mix and about half way up I started to panic. Thankfully, my buddies don’t take any nonsense and a few stern words to remind me that quitting wasn’t an option saw me through long enough for my legs to go numb and for us to reach the exit point. Rivers might be cold, they might be scary but they are GREAT for renewing your legs. A couple minutes of being frozen was like being given completely new legs and we were soon trotting towards the second hill, the chat and mood still exceptionally high considering. It was at this point last year that I hit my wall of pain. The second hill is nothing short of a huge challenge. There is no running here, only crawling. It wasn’t easier this year, I don’t imagine it will get any easier, I wouldn’t want it to. This race pushes you to the limit, but it really gives back as well. And as we picked our way up the Scree Wall with burning calfs and lungs the sense of achievement was incredible. I have run a lot of races, but this one is the one that reminds me exactly what being challenged means. The downhill sections are incredible, and Rat Race marshals are up there with the best. We were reminded by a very stern, yet funny, man that if we could chat we weren’t working hard enough and so we plowed on, past the Red Bull van towards the abesail ropes. Down we went and we were on the home straight. The course was muddy the whole way home, the slightly warmer weather leaving the ground soft and very slippery underfoot. Even the trusty innov-8s weren’t enough at times and we all took a tumble along the way. But we kept going. And that’s the beauty of Deerstalker. If you run when can, walk when you have to, even crawl if you must (or when it’s absolutely necessary), it will provide you with the best experience of your racing year. It’s the biggest night race in the U.K., it’s the only race of its kind, and it doesn’t disappoint. It’s hard, it’s hilly, but it is absolutely worth it. Just don’t ask what the distance is – it’s longer then 10km but not quite a half marathon. Good enough? Thank you Deerstalker, again, for being absolutely breathtakingly exceptional. In events such as this there is always risk. And it was with great sadness and heartache that we heard of the loss of a fellow OCR runner at Deerstalker last night. Our community is one and this loss is felt throughout. Thoughts and prayers go out to the family and friends of the lady runner. Sleep well.